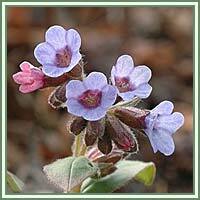 Habitat: Lungwort is native to Europe and western Asia. Description: Lungwort is a perennial plant. It grows up to 20 cm in height and has hairy and alternate, oval-shaped leaves. Basal leaves are wide, and the upper leaves are smaller, usually marked with distinct, white spots. Small tubular flowers appear in clusters. They are red at first, but turn pink-purple as they mature. Flowering occurs during summer. Medicinal use: Lungwort - as its name suggests, has been traditionally used as a remedy against various lung disorders including tuberculosis, asthma and coughs. Lungwort is a very good astringent, demulcent, diuretic, emollient and expectorant. The main substance responsible for its beneficial actions on various lung complaints is mucilage. It can help in treatment of chronic bronchitis, chronic cough, whooping cough and sore throat. 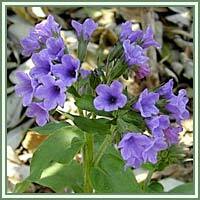 Lungwort is sometimes recommended for gastrointestinal and kidney problems. Used externally, it can be very beneficial in treatment of burns, eczema, hemorrhoids, wounds etc. Safety: Lungwort contains toxic pyrrolizidin alkaloids. It is not advisable to use Lungwort without medical supervision. Always consult your doctor/herbalist before consumption of any herb.